When preparing pasta, always add salt to the water. Google “how to boil water” and you’ll get 82 million results. OK, so it turns out that making perfect pasta is more complicated than we might assume, especially when it comes to actually cooking the pasta. Good pasta is more than boiling water, plus pasta, plus ta-da. Always add a lot of salt to boiling water. As with the myth about the ease of boiling water, you’ll hear that the globe’s pasta experts – the Italians – enjoin that the water “should be as salty as sea water,” which is roughly 3.5 percent saline. That is way too much, really, because that translates to two tablespoons fine-grained salt per quart (or liter) of water. Plus, Italians in fact don’t say, “the pasta water should be as salty as the sea”; only TV chefs say that. It’s opera buffa for the airwaves. One percent saline is about right. To achieve that level, add two teaspoons of table or kosher salt to each quart of water, more if you have a taste for salt. Salting the water does two things: it obviously flavors the pasta, plus (especially at our altitude) it slightly raises the boiling temperature so that you can monitor the cooking progress of the pasta a little more carefully. Keep in mind that, if your sauce or final pasta treatment is itself salty (because, for example, it contains a lot of grated hard cheese or uses capers or anchovies), then it may pay to back off a bit on the salt added to the water in the beginning. 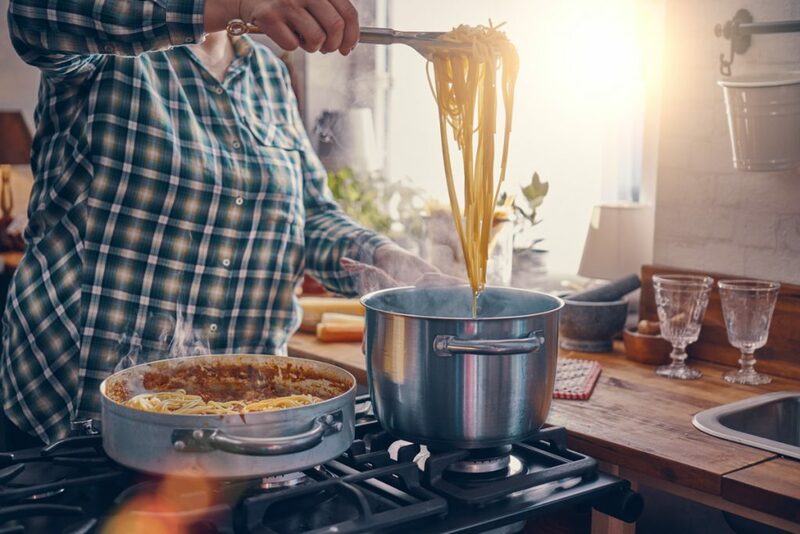 Many cooks add a couple tablespoons of oil to the cooking water, thinking that, on the one hand, it will keep the pasta from sticking together and, on the other, that it keeps any foam from boiling over. “This is one of those sauces that you must try. Once you do, I assure you that you will make it one of your family’s standard recipes. It is quick, simple, and nutritionally sound, and this sauce is at the base of many other recipes. You can double or triple this recipe for big dinners, or you can freeze it and use it in future meals. It keeps in the freezer for a month or two.” L.B. In a large skillet, over medium heat, heat the olive oil. When the oil is hot, add the garlic. Once the garlic is sizzling, add the tomatoes, slosh out the can with 1 cup water, and add that as well. Sprinkle in the red pepper flakes, and season with the salt. Submerge the basil sprig in the sauce. Simmer the sauce until it is slightly thickened, about 15 minutes. Discard the basil. Because the oil floats on the water, even during the tumult of boiling, it indeed does keep the foam down. But the cost of adding the oil to the boiling water far outweighs this minor convenience. Preventing the pot from boiling over is your job. Keep an eye on the water as it returns to the boil; that’s the danger time. Plus, if you use a large boiling pot – pretty much Pasta 101 – any foam recedes quickly and then you’re off the hook. But here’s the really bad news: because the oil does float, as you drain the pasta into the colander in the sink, the pasta pours through the oil and the oil coats the pasta. Slickly oiled pasta prevents the sauce that you’ve prepared from adequately adhering to the pasta. Pasta isn’t there on the dinner plate merely for backup; it’s key. Any pasta carries the sauce with it. Smooth, lighter sauces cling to long pasta as the strands are drawn up to the mouth. Or certain other types of pastas’ nooks and crannies “cup” or snag into themselves the bits and pieces of meat or vegetables in their sauces. If the pasta is greased with oil, it can’t do its job. Big mistake. Boil pasta in a pot that looks too large for the task. The pasta and water need lots of room to move around each other in order for the pasta to cook properly. Stir the boiling pasta and water once in a while. I prefer to use tongs rather than large forks, even so-called “pasta forks.” Tongs also make it easy to snag a piece or strand out of the cauldron to get a feel for how the pasta cooking is coming along. Cook pasta to the point that the Italians call “al dente,” which means (literally) “to the tooth,” signifying a slight resistance at its center when bitten into. We might call it “underdone,” but that’s OK. The pasta will continue to cook a bit after draining (especially if you’re going to finish it in another pan, a very common technique in Italy), or even if it sits a bit before service. Pasta should never be soggy; that’s just not right. Plus, when it’s cooked through, its glycemic index rises (because it’s digested more quickly than when it is al dente) and it’s therefore less healthy for you. Finally, pull out at least one cup of the pasta cooking water. All of it, or even a few tablespoons, may come in handy as a remedial moisturizer as you finish the pasta with its sauce. You don’t want to use plain water from the tap, however hot it may be. It’s flavorless. Finally, don’t just plop a pile of pasta on a plate, then ladle some sauce over it. That may be the lore or common image, but it isn’t the best way to enjoy both foods. Do also as the Italians do and combine both the pasta and sauce in either the now-empty boiling pot or another pan (on low or medium heat) so that the flavors of both marry.